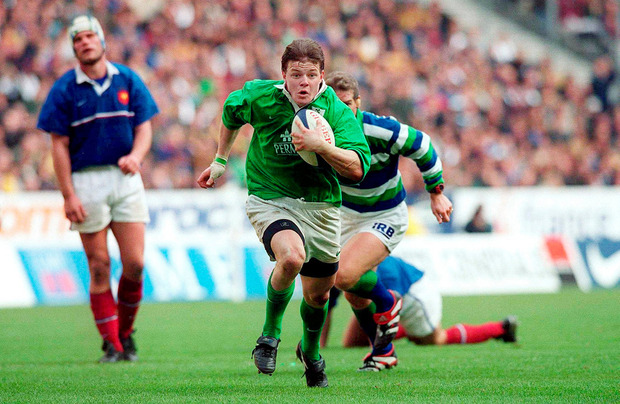 Johnny Sexton’s remarkable drop goal against France added yet another chapter to Ireland’s storied rugby history. With the Paris euphoria still fresh in the mind it begged the question: where does the latest episode rank alongside the greatest occasions for our international game? And still we gazed and still the wonder grew. With respect to the writings of Oliver Goldsmith, in the immediate aftermath of Jonathan Sexton's drop goal those were my thoughts as I and thousands of green-clad supporters in the Stade de France stood in awe at what we had just witnessed. It was no daylight robbery and yet had we lost we couldn't have complained such was the ineptitude of our overall performance. But in one magical, match-winning moment what had gone before was obliterated from the memory. Even Joe Schmidt had to let himself go in the euphoria of the moment and its possible consequences - for a few hours at least. There have been many great Irish drop goals through the years. 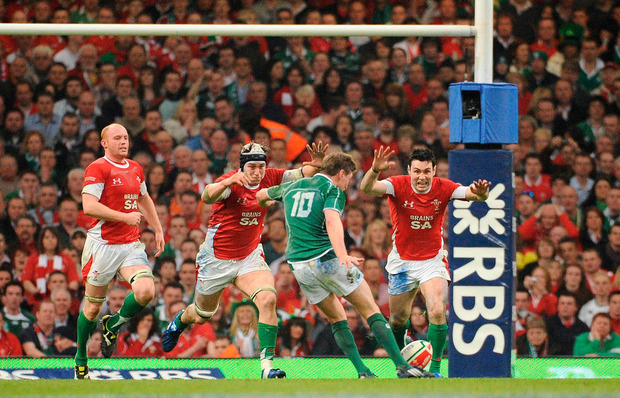 Think Michael Kiernan against England in 1985 or Ronan O'Gara in Cardiff in 2009. The 1985 kick resulted in a second Triple Crown in three seasons, 2009 in our second Grand Slam. The true value of Sexton's remarkable kick (already established in my mind as our greatest in that genre) will be put to the test four more times over the coming weeks. However, given its circumstantial context and the role played by the main man from gathering the ball from the Irish in-goal area to eventually landing the most beautifully-struck drop goal, despite the odds, makes it the greatest Irish drop goal ever. Consequently, I have since compiled my list of the 10 greatest Irish rugby moments I have witnessed as a schoolboy, player and INM journalist following, playing and covering the sport. It is subjective and the beauty of rugby lies very much in the eye of the beholder. That said, I do believe quite a number of the moments I have chosen carry themselves. According to the Oxford dictionary, a moment in time is defined as "an event or experience which presents a good opportunity for learning something about a particular aspect of life". Could there be a more accurate reflection of that definition than what transpired in Croke Park on Saturday, February 24, 2007? Sometimes a sporting occasion transcends itself and on that great day in Dublin 3, thanks to the GAA, it did. I was in the old Lansdowne Road at the schoolboy end in 1973 when John Pullin's England ran on to the field to never-ending applause. The statement made through their travelling (both Scotland and Wales refused to come because of the Troubles the year before) was as courageous as it was immense. That was a very special occasion for reasons way beyond the match, however nothing compares to Croke Park on that memorable day in '07. It is my greatest Irish rugby moment. Recently, RTÉ ran a series compiling the greatest Irish sporting moments and Munster's win over the All Blacks topped the rugby bill. I was privileged to be at both events, but it is a non-contest. Whether it was Packie Bonner's save or Ronnie Delany crossing the Melbourne line for Olympic gold as the all-time freeze frame moment, the English rugby team running out at Croke Park stands alone in rugby terms as it transcended sport in every way. It was the day we announced to the watching world that we had come of age as a nation. Thumping England didn't half add to the occasion either! What made it special and the standalone moment ahead of so many? It could have been any of the four tries but most particularly Ronan O'Gara's slide-rule cross-kick to Shane Horgan for that overhead fetch and touchdown in the most appropriate of venues. Or it might have been the emotion of the occasion summed up in John Hayes's face. Whoever said big Bulls don't cry? Seeing 43-13 on the scoreboard wasn't too shabby either and while we won't pretend it didn't matter, it was second to that incredible moment, that pregnant pause, immediately before and during the anthems. We all wondered how the crowd would react to 'God Save the Queen' in Croke Park. The silence was deafening it was so loaded with respect. How could you possibly get goosebumps from silence? Well, I did along with 82,000 others in Croker that day. Cue Amhrán na Bhfiann. I doubt any Irish crowd has ever bellowed out our anthem more loudly or proudly. Here was a combination of Thomond Park and 'La Marseillaise' on tour. 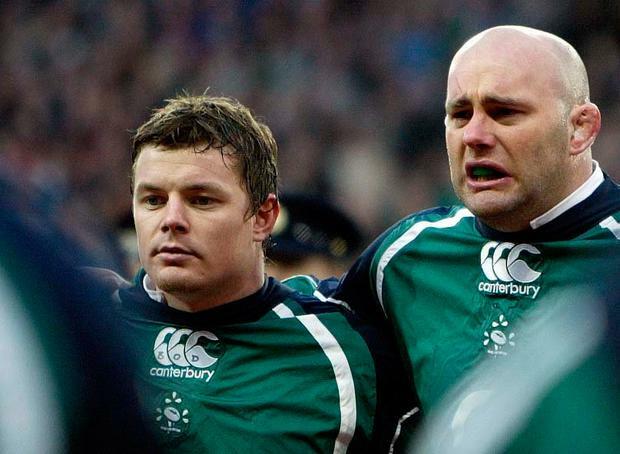 The reigning world champions didn't have a prayer that day but as they had shown some 30-odd years before that, the Anglo-Irish rugby bond is matched only by its rivalry. There have been many iconic tries scored by Irish players, however for the greatest team try, in terms of technical perfection, I defy anyone to come up with better than that scored by Ciaran Fitzgerald's side in Cardiff on the way to that second Triple Crown in three in '85. It followed an attempted attack up the right which culminated in Trevor Ringland (scorer of two crackers that same year in Murrayfield) losing his footing close to the touchline but with Philip Matthews and Jimmy McCoy in support. What followed was French-style attacking rugby at its very best. The perfect plant by McCoy enabled Michael Bradley to sweep the ball away to Paul Dean. Delicate handling and brilliant lines of running at full tilt between the current Irish team manager Brennie Mullin and Michael Kiernan paved the way for Hugo McNeill to hit the line as effectively as any Irish full-back has ever done. More to the point the 'Gremlin' (Keith Crossan) read McNeill's line brilliantly, appearing on his shoulder to take the delicate delivery and race in from the 22 for his first international try and in so many ways our most complete touchdown ever. The 'give it a lash' moniker tends to gloss over the hard graft and meticulous preparation that went into making this try and Mick Doyle's Triple Crown-winning team so special. No further embellishment necessary. It embodied courage and kicking perfection in equal measure. The next five weeks will determine just how iconic it will become but for me, given the context, it's already there. Context is again everything but factoring in the legend that emerged from what we witnessed that day was somehow appropriate. That and his try for the Lions in the opening test in Brisbane in 2001 paved the way for the genius Brian O'Driscoll was set to become. Prior to 2000 we had lost on every visit to Paris since 1972. Even at home our record was abysmal with just a single win and draw since 1983, and don't forget that much-pedalled line about 'bad travellers'. Indeed, going into the game we had lost 15 in-a-row to the French home and away. Enter the skinny kid in the extra-large shirt and the rest is history. Lest we forget it took Sexton-like nerves of steel from David Humphreys with a penalty in the dying minutes to seal the deal (27-25) as a rugby legend announced his arrival on the global stage. It was the ice-cool kick that edged us in front and ultimately to a first Grand Slam in 61 years and to a second clean sweep ever. It was not as difficult as Sexton's drop goal from heaven in St Denis but a fitting tribute and enduring legacy to another of our greatest out-halves and one, who just like the current incumbent, possessed bottle in abundance. You cannot put a value on moral courage in any code. It's what makes legends stand out from the rest. In the end, Stephen Jones' botched penalty attempt saw us home but it was entirely fitting that it took another act of ice in the mind from ROG to put us there. Five Irish tries in a 40-29 victory over the record-breaking unbeaten All Blacks in Chicago - who would have believed it? For those present it was a privilege and if one moment took an extraordinary Irish performance into the realms of rugby immortality, it was when Robbie Henshaw crossed for the fifth and final try. More than 100 years of trying - and we've still to do it on Irish soil - but the Soldier Field battle was special, Chicago was special, the win, and the timing of the workaholic Henshaw's try was indicative of Ireland's 80-plus minutes on the day. I'm stealing a little liberty here but take 'Ginger' McLoughlin carrying the rest of the pack over in '82, Girvan Dempsey touching down in the opposite corner at the same end in '04, Simon Geoghegan's spectacular try in the left-hand corner in '94 and Shane Horgan completing the rugby poker at the same end but opposite flag in 2006. They were four spectacular Irish tries scored at Billy Williams' former cabbage patch. However, let's just say that if we can get to Twickenham still unbeaten in a month's time we'll take any old scruffy try dotted down anywhere. We'll not go into the minutes that followed but when Gordon Hamilton crossed in the old Lansdowne corner at the Havelock End, following Jack Clarke's timely offload, we thought we were home and hosed to take on the All Blacks at the penultimate stage. Alas, that semi-final dream lingers on. I was on commentary duty with George Hamilton that day and suffice to say that two men small in stature left in pain having leapt up and cracked their heads on the low ceiling in the instant euphoria of Hamilton's try. Without doubt our greatest short-lived moment. In the final analysis it took a timely drop goal made in Cork to take a richly-deserved Triple Crown that year. Donal Lenihan, Michael Bradley and Mick 'The Kick' Kiernan were the rebels central to the match-winning moment. Thirty-three empty Triple Crown years between 1949 and 1982 and now two in three. In '82 it was about the pack and Seamus Oliver Campbell but three years on it was the backs leading the way, save for Lenihan's vital sortie and Kiernan's successful kick at the Havelock End to steer us home. Now etched in legend, Ciaran Fitzgerald's "where's your f*****g pride?" plea to his players for one final hurrah and the response through Kiernan was just about pitch perfect. And no, Fitzy, who threw in the ball at that vital lineout, wasn't a Leeside native. The west was and is wide awake. Take your pick from: Ken Goodall v Wales at the Lansdowne Road end in 1970. Or Alan 'Dixie' Duggan from a typical Barry McGann grubber in the same match. Kevin Flynn's last-ditch winner under the Twickenham posts in 1972. Or Noel Mannion's length-of-the pitch run at the Arms Park against the Welsh in '89. What of Mick Galwey and Keith Wood scoring in opposite corners at the Havelock End in wins over the auld enemy in '93 and 2001 respectively. Or Pat Casey at Twickenham on Mike Gibson's debut in '64? The list is endless but again I emphasise the subjectivity attached to this selection and also the obvious difficulty in defining a moment. What of the Ollie Campbell-inspired two-Test win in Australia in '79, or for me the greatest competitive Irish rugby result ever - yes, even greater than Grand Slams, Championships or Triple Crowns. It came in 2011 at the World Cup in New Zealand when we beat Australia 15-6 in the pool decider. And what of the women? Grand Slam winners in 2013 to be followed by that never-to-be forgotten win over the Black Ferns (New Zealand) in France at the World Cup the following year. The Kiwi women had been unbeaten since losing the semi-final of the 1991 World Cup some 23 years before and had taken the four global tournaments ahead of losing to Ireland. Female players like Fiona Coghlan, Alison Miller, Joy Neville, Claire Molloy, Niamh Briggs, Lynn Cantwell, Sophie Spence et al have set the bar particularly high. I could go on and I take immense satisfaction that for the vast majority of the 'moments' covered above, to borrow from the great Welsh bard Max Boyce, 'I too was there'.